The last week has seen some interesting progress for the n900. Firstly it was great to see phototranslator finally being availiable in extras-devel. I wrote a couple of weeks ago about having lost patience waiting and played with OCR myself. However phototranslator has put it together in a slick package and combines with google translate api to provide a pretty cool application.Obviously it is of most use if you are travelling to a foriegn country, translating signs and menus as you go, but it is still interesting to play with and just show off the capabilities of the device (without having to drop to a terminal). Perhaps the major new item this week is sygic's mobile maps being released for sale. There was much rumour that they had been waiting to release via Nokia's ovi store. However, they have made it aviliable for sale via their own site. I purchased it on Friday after some of the initial rush had died down, and sygic had some chance to get their servers working properly. Some of the first off the mark reported painfully slow downloads which dropped and they had to use resuming downloaders to get all the way through. At 1.8gb I didn't really want to deal with download problems. Given that the program requires activation via their site, it's not clear why they didn't just torrent the file and save their servers a lot of problems. Nonetheless when I came to make my purchase I got about 200kb/sec and it downloaded in about 90mins. At this point I was a little concerned about the quality of the app. It's response to the unexpected seems to be to segfault, which doesn't seem like good code to me. However, after actually reading some instructions I realised I should go through manual activation, and that product code != Activation code. I went via their site and got my activation code and at last I was up and running. Once going, I've had no further problems. It's a fast application and seems very good. I've only used it to route me home from work, but it did so well. The thing I noticed was how fast it recalculated when I intentionally deviated from the route. No sooner than I made the turn than I looked down to see new route laid out. To be fair I'm comparing to a now pretty old tomtom, but it's recalculation always took a few seconds of processing. The other thing I noticed was that the map has a housing estate in my town that was built perhaps 5 years ago, but does not have some mini roundabouts on my route home from years before that. I also note that it doesn't seem to care about traffic lights. By which I mean it gives no indication that it would consider them as a factor in routing decisions. I don't know if any do, but I hold out hope one day to get routing that knows that 9am on a weekday could mean several extra minutes going through traffic lights. The maemo forums where quickly full of interesting tips/hacks to enable fullscreen operation & open up more menu options. This allows for portrait operation and more controls. I don't know why sygic didn't have these enabled by default, perhaps they are not fully tested so have been left in an implicit 'unsupported' state, but easy to switch on. Rumours have increased that firmware release 1.2 is imminent. Based on some wishful thinking and the fact that the UK has finally gotten the 1.1.1 release that the rest of the world got weeks ago. Along with a number of bugs being marked explicitly as in pr 1.2. Neither of these things need have any baring on the release of the next update, but wishful thinking is hard to put down :-). I also became aware this week of TweeGo, a new twitter client. This one written with c++/qt and looking very nice. A much slicker ui than my own witter. I am really glad to see more options being actively developed, bringing more choice to n900 users. To have a few new things arriving for the n900 in a short space of time really gave me the feeling that it is gathering momentum. Getting better and better all the time. This momentum enourages more development, and hopefully more good information such as the thread I found, which in turn leads to more, better applications. 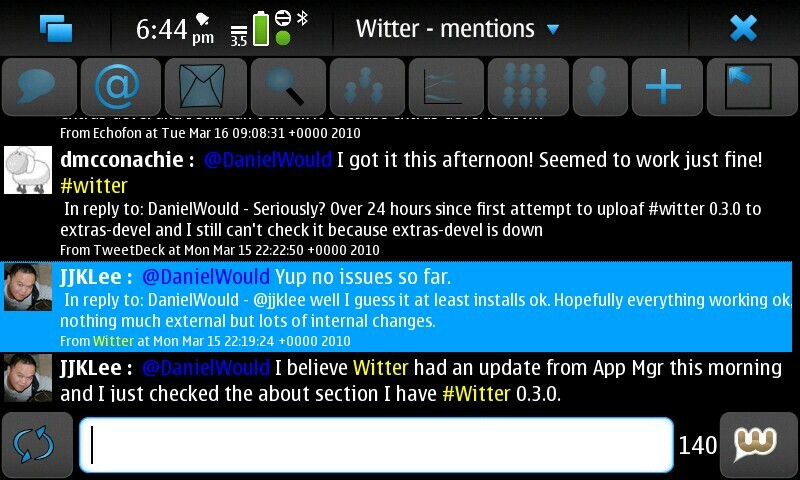 With a cool new technology demo in phototranslator, a great pay-for gps option from sygic and a slick new twitter client in TweeGo, it's hard not to feel optimistic about the future for the N900 after a week like this.